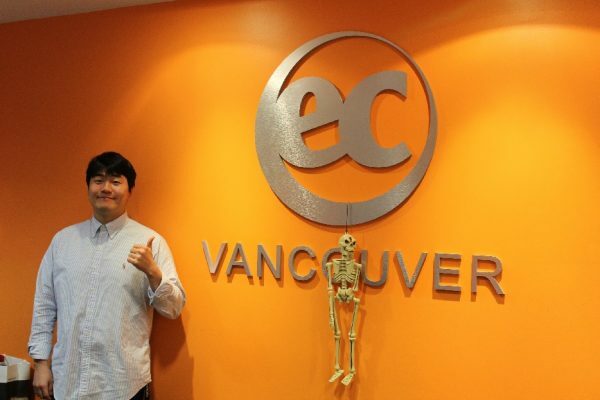 Hanson from Korea shres his experience at EC Vancouver! He has been with us for almost 4 months. “Hi, I’m Hanson. I am from Jeju island in South Korea. When I arrived in Vancouver I was very nervous but this is not a problem because the EC Vancouver team always helped me. I like my class because my class mates are kind and friendly, and teachers make class more interesting and help students focus more on class. If I don’t understand something, the teacher is always great in explaining it to me. The teachers have recommended some great places to visit and things to do in the city students. I think Vancouver is a beautiful, and peaceful city because Vancouver’s nature is so good and fresh. There are a lot of parks in the city where you can hang out with your international friends.